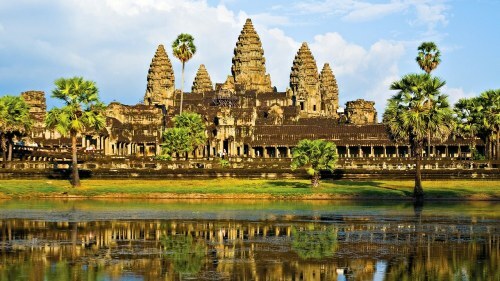 China Eastern has dropped the price of a few flights from Vancouver to Phnom Penh and Siem Reap, Cambodia down to between $493 and $591 CAD roundtrip including taxes. The flights to Phnom Penh have 1 stop each way in Shanghai, China (3.5 hours on the way there, 8.5 hours on the way home). The flights to Siem Reap have 1 stop each way in Shanghai, China (2 hours on the way there, 9 hours on the way home). NOTE: Once your Momondo search completes, you should slide the 'Max Flight Duration' slider on the left down to 51, to see these flights. 2. Change the trip type (underneath the origin box) from 'Return Trip to 'Multi City'. Try dates from the list of dates for the regular roundtrip flights above. Update 8/3 - These no longer seem to be showing up on Momondo, but the cheap prices from Vancouver to Siem Reap, Cambodia are showing up on Kayak, and on the China Eastern website once you click through. You can also try Phnom Penh, Cambodia - but it didn't seem like there were any cheap ones. The price always jumps up for Phnom Penh when you get to the China Eastern website. 3. Click through from Kayak to the website showing the cheap price. 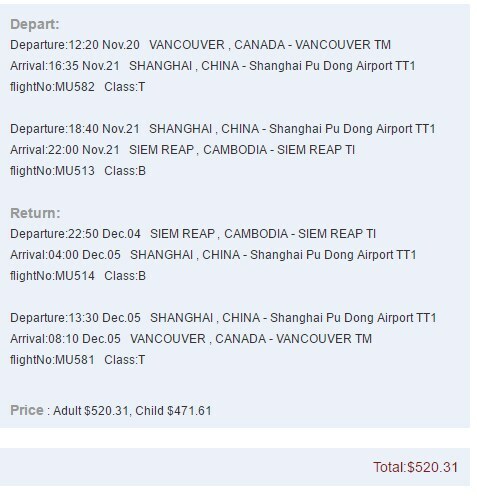 vancouver, yvr, flight deals, asia, china eastern, southeast asia, phnom penh, cambodia, pnh, siem reap and rep.